London, April 10: UK Prime Minister Theresa May on Wednesday expressed regret for Jallianwala Bagh massacre in the British parliament, but didn't tender an apology. "We deeply regret what happened and the suffering caused," Theresa May told the British parliament as India prepares to mark the centenary year of the Jallianwala Bagh massacre. "The tragedy of Jallianwala Bagh of 1919 is a shameful scar on British Indian history. As Her Majesty the Queen (Elizabeth II) said before visiting Jallianwala Bagh in 1997, it is a distressing example of our past history with India," she said in her statement. 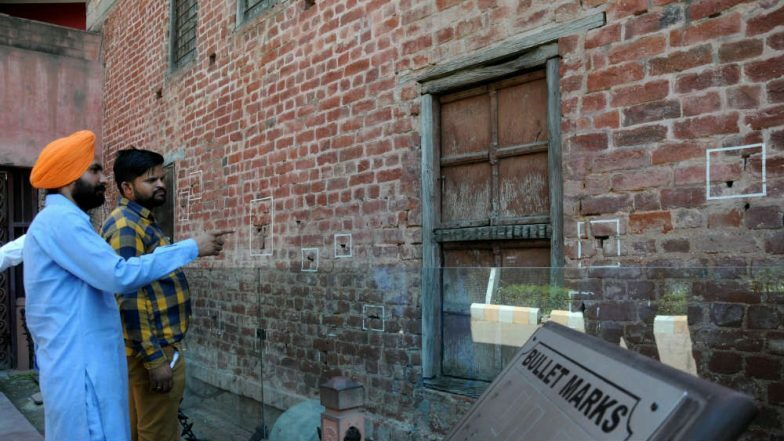 Punjab Govt to Build Jallianwala Bagh Massacre Memorial with Soil from 13k Villages. Reacting to May's statement, Jeremy Corbyn, leader of the main opposition Labour Party, demanded "a full, clear and unequivocal apology". Veteran Indian-origin Labour MP Virendra Sharma had earlier called for a formal apology to be made by May. Former British prime minister David Cameron described it as "deeply shameful" during his visit to India in 2013 but didn't issue an apology. In 1919 on April 13, British General Reginald Dyer opened fire on a peaceful gathering of unarmed people at the Jallianwala Bagh in Amritsar. Hundreds of people lost their lives and many more were injured as they were trapped in an enclosed area, under relentless, unprovoked firing, with the only exit from the park blocked. Cabinet Approves Amendment of Jallianwala Bagh National Memorial Act, 1951. Historical records note that General Dyer had fired on a Baisakhi gathering without warning and continued to fire for 10 minutes even as the people were trying to escape. The UK government had said on February 20 that it was “reflecting” on demands for a formal apology for the Jallianwala Bagh massacre during the British Raj.